At this year’s Cannes, the renowned director Martin Scorsese announced the completion of a seven year labour of love: the restoration of the classic 1940s British film, The Red Shoes. Scorsese has never been shy about revealing which films have inspired him: in two documentaries he produced in the late 1990s he discussed the importance that both classical Hollywood and post-war Italian cinema played in making him decide to become a film-maker. Through his World Cinema Foundation, launched in 2007, he continues to spearhead efforts to recover and to restore classic forgotten films which otherwise may have been forever lost. His relationship to The Red Shoes, though, seems to me to be outside of much of this. Indeed, for a director whose work is generally associated with realism, violence and Catholic guilt, it perhaps seems odd that he should hold in such esteem a melodramatic romance about ballet based around a Hans Christian Andersen fairytale. Yet in interviews he has candidly described it as ‘the movie that plays in my heart’; his dedication to its preservation and his fervent championing of both it and the wider canon of films by Michael Powell and Emeric Pressburger show that the film has more than a great significance for him. The key to an appreciation of the film is to understand that at its core it is about the creation of artistic spectacle, and the sacrifices which must be made in its process. Take away the film’s romance plotline, one that can be found in countless matinee melodramas, and what is left is one of the darkest portraits of obsession put on screen, a clear inspiration for Scorsese’s own maniacal protagonists as well as those of messrs Schrader, Coppola, De Palma et al; a deep plunge into the heart of darkness of all artistic creativity. The story will revolve around a curious ménage à trois between two younger characters trying to enter the ballet world and an older one who knows no other world, but to begin with they are all, like the cinema audience themselves, spectators. The world famous Ballet Lermontov has come to London, led by the charismatic but enigmatic Boris Lermontov and starring renowned prima ballerina Irina Boronskaja. In the audience, eager to catch the attention of the Russian impresario is Vicki Page, whose influential aunt Lady Neston forcibly tries to arrange an impromptu audition for at the aftershow party. Lermontov is disinterested, but enquires why it is she wants to dance. “Why do you want to live?” Vicki replies somewhat rhetorically; within this exchange it is clear that he sees something of promise, and so invites her to study with his company. The third main character comes to the fore the following morning; Julian Craster is a young student of Lermontov’s conductor who believes his master has plagiarised his own compositions for use in the last night’s production. Lermontov agrees – quipping “It is much more disheartening to have to steal than to be stolen from” – and promptly hires Craster as his new orchestral coach. Through the eyes of these two inexperienced newcomers we are thrust into the world of ballet behind the stage. A montage of scenes shows use the messy underweave of the tapestry, a beautiful confusion of dancers, stage hands, set dressing and musicians, all under the steely gaze of Lermontov, a solitary seated figure in the shadows of the stalls. The company moves to Paris, but once there prima ballerina Boronskaja announces she has married. She is congratulated by her colleagues, but when she looks for Lermontov he has disappeared; she observes that he must have no heart. Cut to him alone, smoking in a darkened study, visibly distracted. He calls for Craster and dramatically announces to him that he plans to produce in Monte Carlo a ballet of the Hans Christian Anderson fairytale The Red Shoes, in which a girl is offered some footwear by a demonic shoemaker which cause her to dance uncontrollably, leading to her eventual death. Boronskaja is dismissed, Page is promoted to top billing and Craster is to compose the score. Until this point, the film has been light in tone, but the introduction of the fairytale interrupts this and announces something very different. Witness the abrupt cut to Lermontov closing the score book to reveal its title, emblazoned in red, and how it sends Craster into a trance, unable to hear what the director is saying. And then see the Russian’s impassioned explanation of the synopsis, clutching a sculpture of a ballet shoe, and then his quick dismissal of the girl’s sad fate. The loss of Boronskaja to wedlock has lit some form of fire inside of him, but motivated by what? Sexual jealousy? Speaking to Ljubov, his chief choreographer, he pours scorn on those who seek human love, suggesting one who succumbs to it can never be a great dancer. The choice, one which he has clearly made himself, is between love or complete commitment to one’s art. Some readings of the film read Lermontov as being a repressed homosexual, but this makes for a much less interesting character, and in reality there is little on-screen to suggest this; it is his entire repression of all sexuality which is most in evidence, and some are fooled by the fact that both actor Anton Walbrook and the character’s real-life model Sergei Diaghilev were openly gay. The ballet is a spectacular success, and as Vicky and Julian are thrust together during the preparations for the new production, a romance between them unsurprisingly blossoms. Lermontov is once again furious with what he perceives as his new muse’s betrayal of him. Unlike Boronskaja, though, he presents her with a choice: married life with Julian or become a great dancer under his tutelage. And thus, he has transformed from the charming, inscrutable figure at the start of the film into tragic villain by the end, undone by his own pride and perfectionism, much like Charles Foster Kane in another film. The Red Shoes was not an immediate success on release, despite the name the Powell and Pressburger had forged for themselves on the back of hits A Matter of Life and Death [aka Stairway to Heaven] (1946) and Black Narcissus (1947). J Arthur Rank saw such little commercial potential in the film that he left its initial screening without saying a word to the directors, and subsequently only supplied one print for the entire US market. That print went on to screen continuously in a small New York cinema for nearly two years before it gained a wider distribution, and eventually went on to win two Oscars, as well as opening up ballet to a younger, much wider audience. The film’s enduring critical appeal stems from the darkness and ambiguity of the Lermontov character, played with sympathy by Anton Walbrook. His fall is one of the most tragic in screen history, without any doubt up there with the likes of Citizen Kane (1941) and The Godfather (1972), and as an examination of the process and problematic nature of artistic creation, it can also be placed alongside Fellini’s 8 ½ (1963). And yet, the continuing popular image of the film is not one of tragedy but great joy. This is, of course, thanks in no small part to its lush bombardment of the senses: Brian Easdale’s magnificent Oscar-winning score, the physical splendour of the cast of famed ballet dancers Robert Helpmann, Léonide Massine and Ludmilla Tchérina alongside the ravishingly beautiful Moira Shearer in the lead role, all captured in dazzling Technicolor by cinematographer Jack Cardiff. Cardiff, who died last month, had already pushed back the boundaries of visual possibilities on Powell and Pressburger’s last two films, but this would become his most loved work. 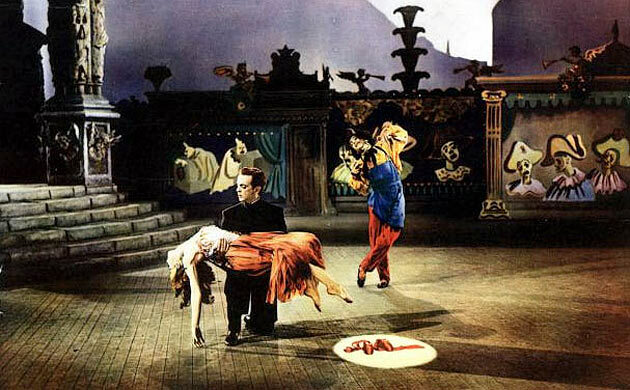 The film’s centrepiece, the seventeen-minute Red Shoes ballet, is quite the most extraordinary montage of dance, motion, light, colour and in-camera wizardry, set on a stage but defying it by every means, transporting the dancer to a nightmarish nether-world where she floats, soars, plummets, and dances to her eventual death. The camera completely eschews objectivity, immersing the viewer in subjective visions. The expressionistic use of colour was unlike anything seen before, and would notably resurface in Scorsese’s own Mean Streets (1973), while the choreography would be an influence on the filming of Raging Bull (1980). The ballet sequence is clearly marked as artifice, but as the film ends with its tragic repetition, the frame dissolves to a burned-out candle atop a book marked Hans Christian Andersen, the candle which the observant viewer will have remembered as being the very first frame of the film after the title cards. The entire film has, like the ballet, been a kind-of fairytale, typically filled with melodrama, romance and villainy. Post-war, this kind of filmmaking was unfashionable: realism was king, and the fantastical likes of Jean Cocteau’s La belle et la bête (1946) had been criticized for their lack of political commitment.. Looking back at it now, The Red Shoes is such an established classic that it is easy to forget what a gamble it was for Powell and Pressburger, and like the great art contained within the film, how ambitious and ambiguous it all is.